"The Demon Photographer" is the 82nd Mandrake Sunday story. The story was written by Lee Falk and drawn by Phil Davis. Traveling in the foothills of mount Arat our friends meets a demon photographer, who steals spirits when he takes pictures. Morka, a man in the village. A remote village, in the foothills of mt Arat. 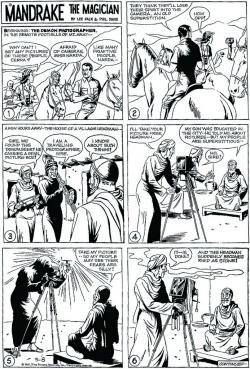 The story title is taken from the strip of May 1 and 8, 1960 (Next Week: "Demon Photographer" & Beginning: The Demon Photographer). This page was last edited on 4 November 2018, at 18:58.